Vegan Eats and Treats! : MoFo: 30 Pounds of Tomatoes ~ and a Doodle Giveaway! MoFo: 30 Pounds of Tomatoes ~ and a Doodle Giveaway! Yesterday my aunt Laura and her partner had a special opportunity to pick tomatoes. Through a friend, they were invited to help glean the end of the organic, dry-farmed tomato harvest and they picked a TON of tomatoes. When Laura called me, she basically asked me "How many can you handle?" BRING IT. 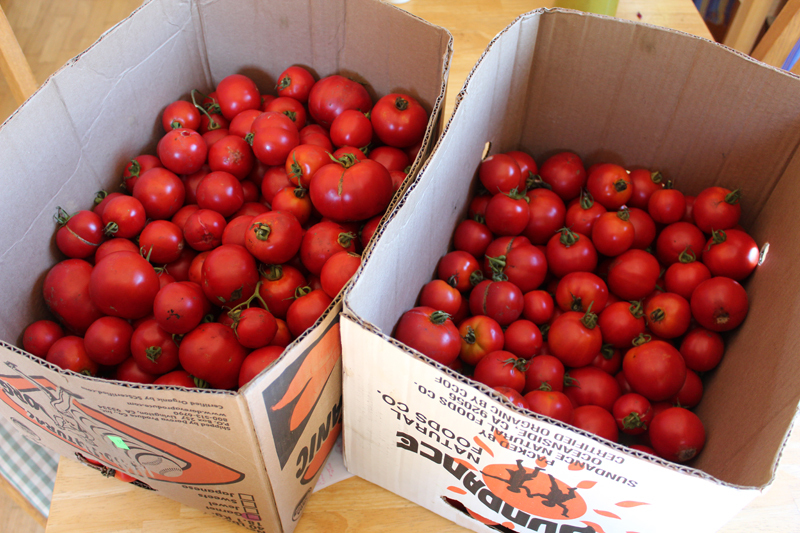 They were so incredibly generous and brought me two huge cardboard boxes of tomatoes - about 30 pounds. (Thank you!!!) When a gift like this befalls you, you gotta clear your schedule, because it's gonna take some time. I tasked Mr VE&T with walking the dogs today, so that I could get busy with tomatoes. The first item on my agenda was to can up a bunch of diced stewed tomatoes for winter. I especially wanted to quickly process the fruits that were a little damaged or wouldn't last even a couple of days. 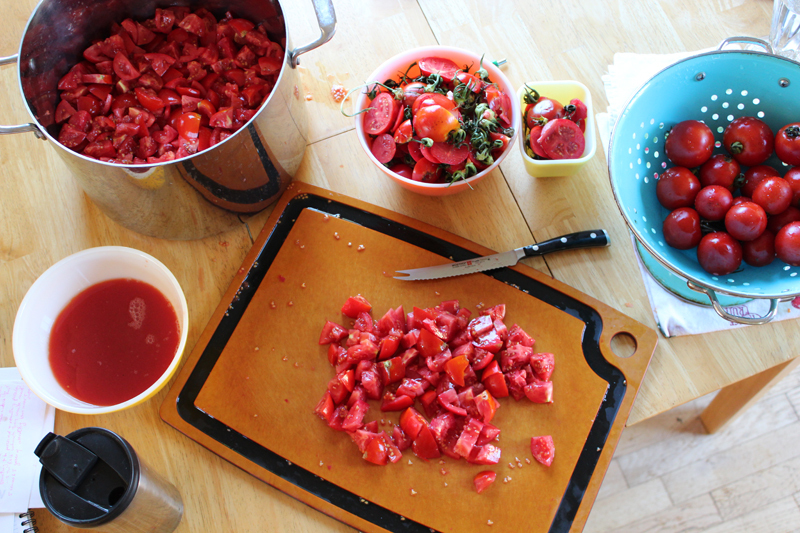 So I got to work: washing the tomatoes, de-stemming and chopping off the icky bits, dicing the rest, and draining off the excess juices. Next I brought the diced tomatoes to boil in a giant pot and let them boil for 5-10 minutes or so - partly to kill off any lingering bad bacteria, and also just to let the tomatoes cook down a bit. I like them better that way. 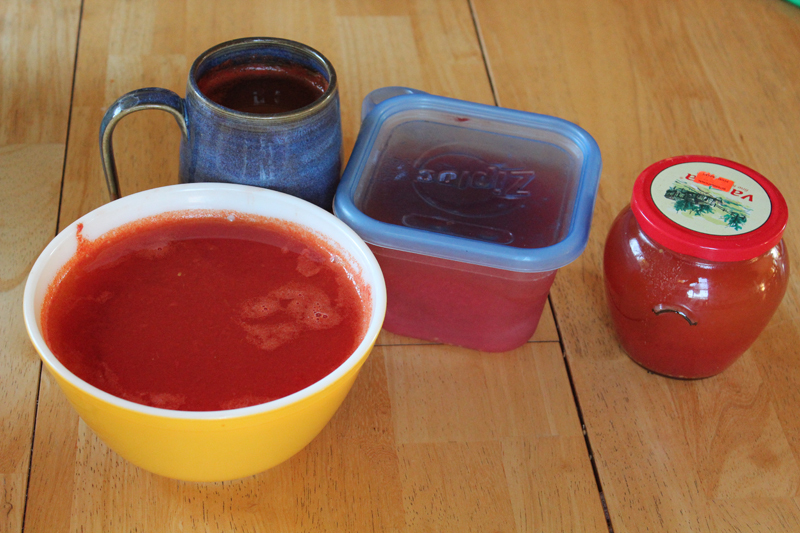 After they've cooked, I ladle off the extra tomato juice, so that the canned tomatoes will be less liquidy. I have a LOT of tomato juice on my hands right now. Time for tomato soup? 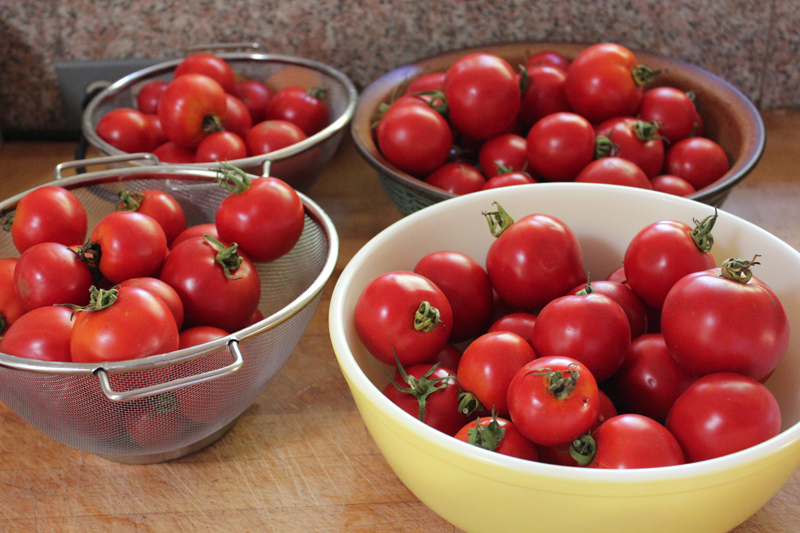 Then I carefully put the tomatoes into my sterilized jars, and processed them for another 20 minutes. 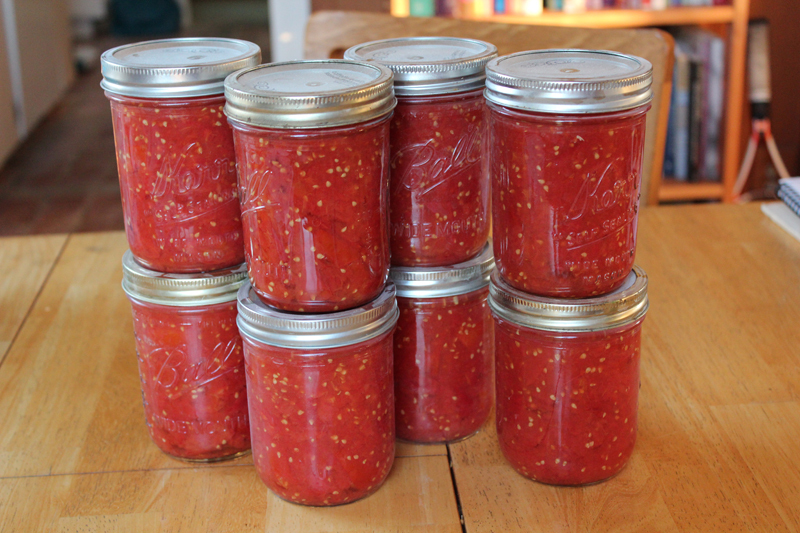 In all, I got 18 pints of diced tomatoes - little jars of bright red summer-in-a-bottle... all ready to be tucked away for winter time. Plus, I still have all of these guys left on my counter top. These are the fruits without blemishes, which means they didn't quite require such rapid processing. I suspect I might well get a few more MoFo posts out of this glorious haul. What can I say, I got tomatoes on my mind! To enter: leave a comment on this blogpost and just say something nice about tomatoes or doodles or pets or summertime or whatever. Winner will be chosen on the Last Day of VeganMoFo: Sept 30th! What a lucky tomato haul! That's a lot of work, but you're going to be so happy in the winter when you're eating summer tomatoes. There's really nothing like them. I'm so glad you're doing the giveaway!! Best giveaway prize ever!!! I'm so excited for this giveaway! I've been enjoying all of your MoFo posts and plan on trying my hand at Cinque e cinque sandwiches this weekend. Yay! I'm so happy you decided to go ahead with this giveaway! I've been so in love with your doodles since I found your blog!thank you for the chance to win! What a sweet idea! Also I love how much canning you do - I'm a little scared off by the whole process but your posts are encouraging! Yummy tomatoes! I love your beautiful jars. There is something so satisfying about putting up food. I've only ever made jam but maybe I should try canning some other fruits or veggies. We are just coming in to summer time here, spring has sprung so the summer months won't be far off. With diced tomatoes you can always make a meal! 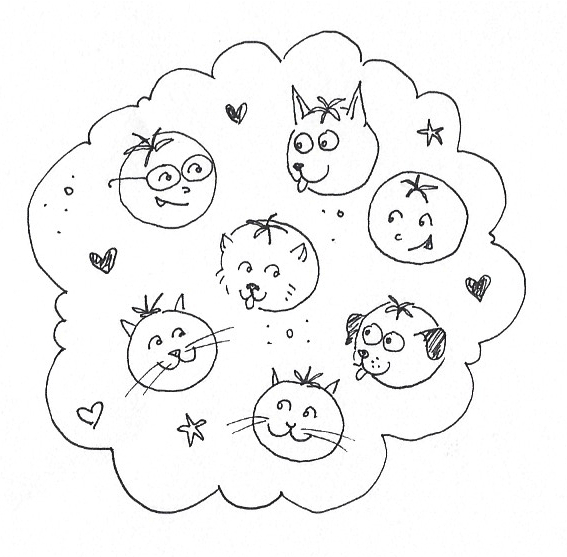 Love your blog and doodles!!! Growing up, we only had access to grocery store tomatoes and I wasn't a fan. But after I had my first farmers market heirloom tomato... All bets were off! While I was pregnant, I craved tomatoes with basil and basalmic vinegar. Yum! I canned tomatoes two mornings ago, so this looks very familiar - but I only did 6 pounds! I just love how cheery jars of food look on the shelf! Your tomato-family doodle cracks me up! Your blog is always so much fun to read. Thanks for doing MoFo again this year, and bringing us so many great posts! This is the best giveaway idea ever! I love your drawings and am amazed at how many tomatoes you've volunteered to take; totally inspiring. I look forward to seeing what you end up doing with the rest! Wow, I'm jealous of your tomato haul! I'd be making a lot of pasta sauce and gazpacho. I wish I had your dedication to preserving/canning. It just looks like so much work to me, and I'm afraid I'd give us all botulism :) I'd look at 30 pounds of tomatoes and cry at all the work needed. You are so inspiring to me! what a great present. you have the best family! and i super love your doodles! Best giveaway ever! And best gift from an aunt ever! Man, I wish I had even just a few beautiful fresh tomatoes like those right now! Wow! That's an amazing amount of tomatoes! I had bolognese for dinner and after seeing your photos I am craving it again already! I think I have tomato envy! Yum! Oh no! My 3 AM tomato post-commetn from my phone didn't work...I don't think I can remember it, as it was written at 3 AM when I could not sleep. It was in rhyming couplet form. Sadness and woe. Oh well, I wrote a limerick tonight! Love you Amey! Thank you so much for your sweet comment on my blog :). What I ate was delicious, haha! Lovely that you make so much nice stuff from so so so much tomatoes! I love tomatoes, haha. Good lord that's a lot of tomatoes! I haven't done much preserving in the past but I'd like to learn some tips, in case fruit/veg opportunities like yours come up! I would love to win a doodle of my furry kids! How totally fun! Your post brought back memories from two years ago when my friend scored 60 lbs of tomatoes in the same way. We made lots and lots and lots of tomato sauce! She moved away in august and I really miss her sweet face! Ooh I love going to the markets at the end of the day and picking up cheap boxes of tomatoes to make sauce with - it's so satisfying knowing you have your supplies all sorted! I love your doodles and I love my pets and I would LOVE a doodle of my pets - my pet family is similar in size to yours! Also, I am so sad tomato season is over here. Le sigh. I love your doodles. I would love to see my dog Andy as a doodle! Wow I would be in heaven! I have been so obsessed with fresh tomatoes this summer. Some of my customers have been supplying me with some from their gardens and I made fresh sauce for the first time I think ever! It will be great to have them during the winter months too, so good job on the canning front. I love your doodles! They are signature you. I was always jealous at school of the kids in my classes who did really cool doodles. My cartooning game is at an all-time low..
Amey I've been reading your blog for YEARS (way before I knew I would be moving to California and would meet you in person!) and your doodles are what first caught my attention and made me a loyal reader - I would LOVE to have a doodle of my family! Also I am so happy to hear that you couldn't touch your toes...which sounds weird, but it's because I have SUCH tight hamstrings and sometimes it makes me feel like I don't belong in a yoga class because everyone else is so bendy. But it makes me feel okay to know that not every yogi was miraculously bendy when he/she started out. My cat roommate and I would love to be pictured by you! Since summer is ending, I try to eat as many raw tomatoes as I can: salad, sandwiches...When winter comes here, tomatoes are not the same and I almost quit eating them until next summer. Things I won't miss: the heat! SC hasn't been too bad, but I've been running at lunch up in south San Jose all summer and, well, to give you an idea of how it's been: the other day I thought to myself "it's really not bad out today" and when I got back and checked the thermostat, it was 86F. Ha ha ha! Awww, I love your doodles! Best thing about summer: cabin on the lake! My comment keeps disappearing.... anyway, I would love to win a doodle of my family from you. I really like a tomato soup and I make it quite often since it's one of the few soups that my kids like as well. I'd love a doodle! I've read your blog awhile and it's one of my favorite things about your blog. Plus your great personality just shines through. I just had tomato soup yesterday and might have some today for a late lunch. 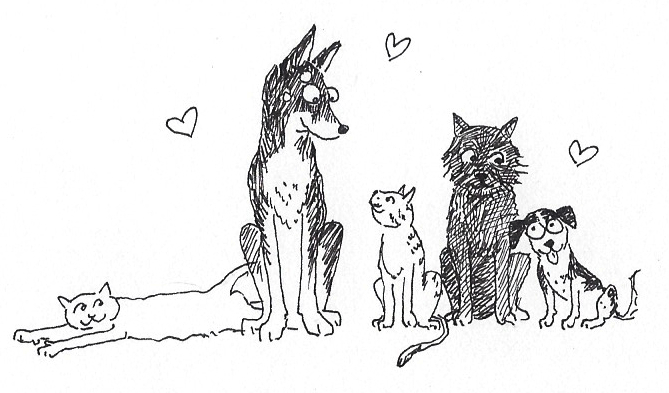 This probably sounds totally strange, but I love your doodles so much, I've started picturing my life in them. I probably need a real one of my family just so my life can be complete! :-) So glad you are posting regularly this month. I'm enjoying having a new fun post (and doodle) to read each day!